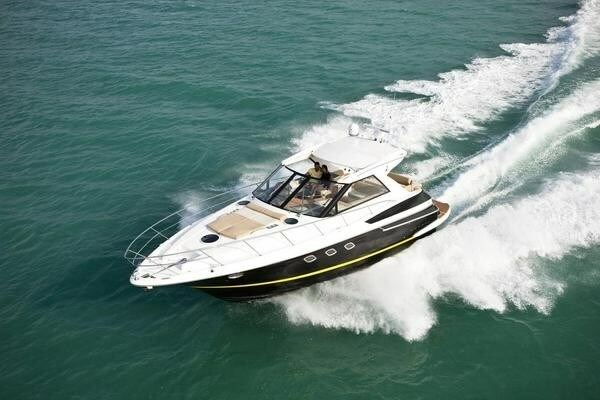 Regal’s new for 2010 44 Sport Coupe is the second largest of its six model Sportyachts offering from 38 to 53 feet. At first glance, the 44SC may appear to be simply a further iteration of Regal’s 4460 Commodore, but the two models are quite different in many unique ways and are intended for different markets. The 44SC offers a full fixed hardtop forward to the windshield header, a single level cockpit sole from the transom steps forward, and an optional solid cockpit enclosure with sliding door and window to completely enclose the majority of the cockpit and render any canvas as unnecessary, unless you really want that final bit of cockpit covered. In addition, a full-beam sunroof power retracts into the hardtop to reveal 38 square feet of natural lighting and ventilation and provides easy stand-up access through the walk-thru center windshield to the expansive foredeck. Regal has offered dual access from the swim platform to the cockpit in previous models, but the 44SC takes this one step further by providing a removable seat that completes the stern lounge on either the port or starboard side, thus affording full flexibility in boarding and seating. The cockpit offers virtually full-surround seating in both its forward and aft sections. A refreshment center is standard. Two cockpit tables are optional. The salon and galley are richly appointed and offer almost seven feet of headroom and your choice of cherry or maple hardwood flooring and four choices of fabric decor packages. The dinette table is hydraulically actuated in front of a full size convertible sofa. The forward stateroom features an island berth with innerspring mattress, mirrored bulkhead, its own flatscreen TV, and private entrance to the main head with separate shower stall. The mid-stateroom features two berths with innerspring mattresses, a privacy pocket door and a separate head with stand-up shower stall. Two-zone air conditioning/heating in the cabin is standard as is a generator. Notable optional equipment includes auto-pilot, granite countertops, icemaker, hydraulic swim platform, extra flatscreens, upgraded stereos and navigation electronics, and a washer/dryer combo. Two diesel and one gasoline Volvo IPS w/joystick control engine choices are available.